I am Joy Whittam, your local editor and Hollingdean resident inviting you to find out about Hollingdean, past and present. If you have a story, memory or information to share about this area, you can help to build up this archive for the future. 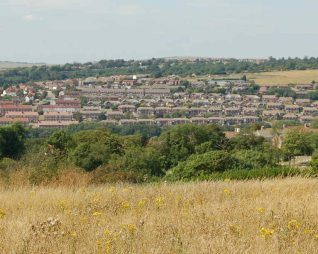 What we now think of as Hollingdean lies between Ditchling Road and Lewes Road, bordered to the north by downland including HollingburyPark and Hillfort, and to the south by Upper Hollingdean Road and the Corporation Depot site. We have some of the most stunning views in the town! Well, whilst most of Georgian and Victorian Brighton were preoccupied with seaside pleasures, the beginnings of Hollingdean developed a little way out on the edge of the town as building moved uphill following the Ditchling Road. From ‘Dog Kennel’ (now Upper Hollingdean) Road onwards the area provided many of the essential practical services that the town required. Along the way its industries – large and small – have included the waste depot with its ‘Dust Destructor’ chimneys, the abattoir with animals being driven up from the Lewes Road, the wholesale meat market, steam and hand laundries, dairies, orchards, rides to exercise the horses from Preston Barracks, allotments and smallholdings, farms and chalk quarries, and the Roedale nurseries for the town’s parks and gardens department. As Brighton grew so did the development of the ‘new town’ of Hollingdean particularly from the mid 1920s to late 1930s and then again with the building of council housing in the early 1950s onwards, followed by several self build schemes in the 1960s and 1980s. Why am I interested in Hollingdean history? It started when I read a contribution to a local history book by a previous occupant of my house who had lived in it for 60 years. The book ‘The history of Hollingdean’ was a collection of memories from long time residents compiled by Hertford Junior School and I began to serialise extracts from it in our local community newsletter, Hollingdean News. This grew into a ‘Local History’ column and has generated a lot of interest. We welcome contributions about Hollingdean. Maybe you have some memories or photographs you would like to share. Please leave a message, with an email contact, in the comments below. Hello Joy. I moved up to Mountfields around 1953/4. I remember that there were no roads as such, only chalk tracks. We lived at the top and had one of the finished houses. Most of the others had the baths etc sitting outside waiting to be fitted! The gardens were not even fenced off. I can never forget the smell of our brand new home, I would sit on my small stool and look out the back across to the racehill area. My Father, who only died three years ago, lived in that house from day one. Unfortunately, when Dad died, my sister and I desperately wanted to keep the house and all it’s memories. But dad was told years back, that he never earned enough to buy our home – he was a postman – so he rented it all those years! My son was willing to exchange his three bedroom house for the two bedroom house in Mountfields, but unfortunately it went to a single mother. I lived at 22 Davey Drive for many years with my parents. 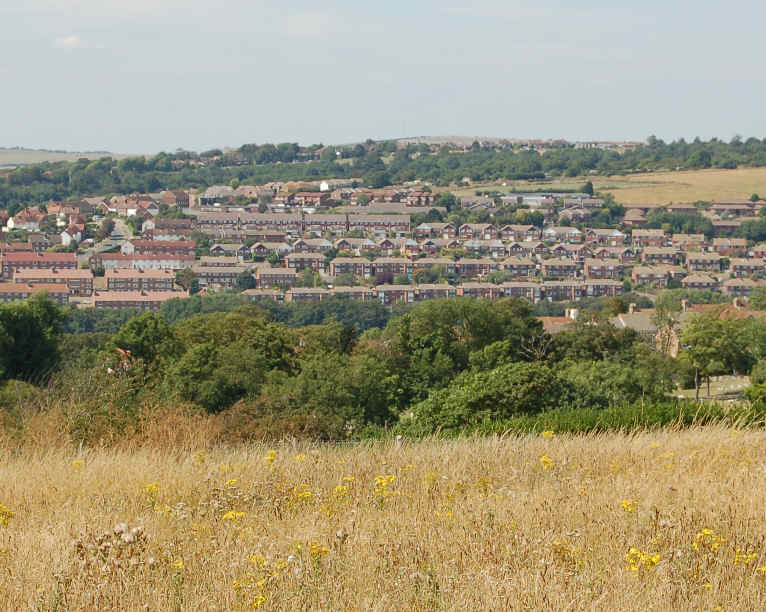 The photo on the front page of the Hollingdean section shows a row of houses and the one we lived in is in the picture. Dear Joy I live in Hollingbury Rise My family are the 3rd owners of the property.I was given the deeds to the house stating the completion date of 13th May 1931 by ‘Braybon’ Would you be able to point me in the direction of any possible original photographs?